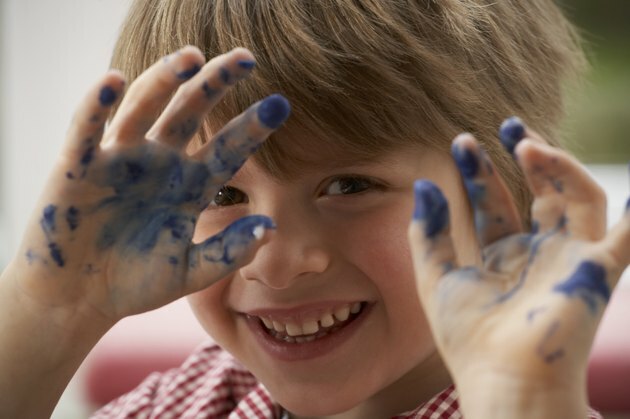 Small children love to get messy, especially if they get to be messy while they're making art. Some art supplies, however, can be dangerous if they are ingested. While art supplies aren't intended to be swallowed, young children are often unpredictable and impulsive, so it's important to understand a few facts about the art supplies in your home or classroom before allowing children to use them. Toxic chemicals can have a more pronounced effect on a child's body than on an adult's. Children have less body mass, more sensitive skin and faster metabolisms, meaning that they can absorb toxic or dangerous substances more quickly than an adult. If you are afraid a child near you has been exposed to a poisonous substance, it's essential that you contact emergency professionals immediately. Be prepared to explain basic details about the child, the current situation and any chemicals that may have been ingested. When purchasing art supplies for your children, examine the box carefully. Any art supplies that contain hazardous materials will be labeled as such, with large danger warnings such as "Harmful if Swallowed" or "May Cause Skin Irritation". In addition, the safest children's paints and art supplies aren't just labeled "non-toxic", they also bear the "AP - Approved Product" seal of the Art and Creative Materials Institute (ACMI). Products with this label have been certified to be safe for both children and adults, and must go through rigorous testing. If the formula of the product changes, they must be re-certified. These seals help consumers make confident choices about the safety of the art supplies their children will be using. If there is a specific product that you'd like to use with your child, but it does not bear the ACMI seal or an ingredients list, you can still check to see if it is safe. Manufacturers generate Materials Safety Data Sheets (MSDS) for their products. These sheets list all the ingredients a product contains, as well as if there is a risk associated with using the product. The sheets can be found in online databases (see resource below), then printed out for easy reference. Even if the paints your child is using are completely non-toxic, he may still experience side effects, such as an upset stomach, colored tongue or bad taste in his mouth after consuming paint. In addition, if the paint is used by more than one child, it could be contaminated with bacteria that could cause illness. To keep children safe, provide each child with a separate palette or set of paint pots. Avoid storing paint after it has been mixed, as the preservatives have been diluted and the paint may not stay stable. Encourage children to wash their hands before and after painting, and discourage them from putting paint, paintbrushes or rags in their mouths.